Many species of filarial nematodes depend on Wolbachia endobacteria to carry out their life cycle. Other species are naturally Wolbachia-free. The biological mechanisms underpinning Wolbachia-dependence and independence in filarial nematodes are not known. Previous studies have indicated that Wolbachia have an impact on mitochondrial gene expression, which may suggest a role in energy metabolism. If Wolbachia can supplement host energy metabolism, reduced mitochondrial function in infected filarial species may account for Wolbachia-dependence. Wolbachia also have a strong influence on mitochondrial evolution due to vertical co-transmission. This could drive alterations in mitochondrial genome sequence in infected species. Comparisons between the mitochondrial genome sequences of Wolbachia-dependent and independent filarial worms may reveal differences indicative of altered mitochondrial function. The mitochondrial genomes of 5 species of filarial nematodes, Acanthocheilonema viteae, Chandlerella quiscali, Loa loa, Onchocerca flexuosa, and Wuchereria bancrofti, were sequenced, annotated and compared with available mitochondrial genome sequences from Brugia malayi, Dirofilaria immitis, Onchocerca volvulus and Setaria digitata. 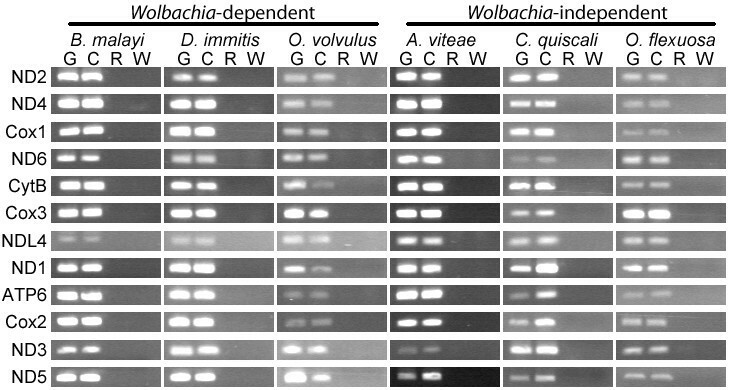 B. malayi, D. immitis, O. volvulus and W. bancrofti are Wolbachia-dependent while A. viteae, C. quiscali, L. loa, O. flexuosa and S. digitata are Wolbachia-free. The 9 mitochondrial genomes were similar in size and AT content and encoded the same 12 protein-coding genes, 22 tRNAs and 2 rRNAs. 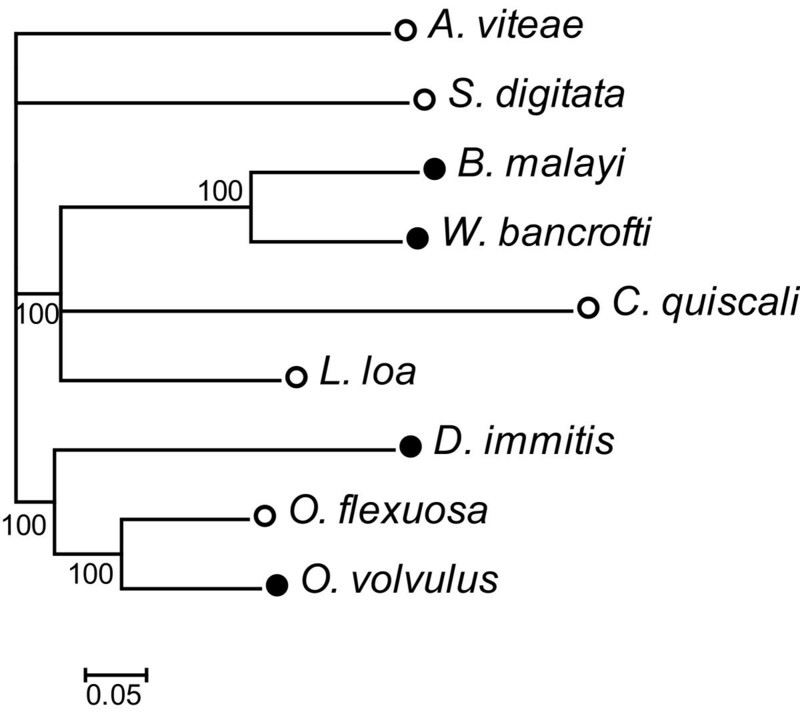 Synteny was perfectly preserved in all species except C. quiscali, which had a different order for 5 tRNA genes. Protein-coding genes were expressed at the RNA level in all examined species. In phylogenetic trees based on mitochondrial protein-coding sequences, species did not cluster according to Wolbachia dependence. Thus far, no discernable differences were detected between the mitochondrial genome sequences of Wolbachia-dependent and independent species. Additional research will be needed to determine whether mitochondria from Wolbachia-dependent filarial species show reduced function in comparison to the mitochondria of Wolbachia-independent species despite their sequence-level similarities. Filarial nematodes are arthropod borne parasitic worms that infect hundreds of millions of people throughout the tropics and sub-tropics and are responsible for a great deal of morbidity in humans and domestic animals. Many filarial pathogens, such as the agents of lymphatic filariasis and river blindness, require a bacterial endosymbiont, Wolbachia pipientis, to carry out their life cycle [1–4]. In these species, depletion of the endosymbiont causes defects in growth, molting and fertility, leading to the death of the worm [5–7]. Other filarial species, some of which are very closely related to Wolbachia-dependent sister taxa, are naturally Wolbachia-free [1, 2, 8–10]. Thus far, there are no discernable patterns in Wolbachia distribution (e.g., based on host species, vector species, tissue tropism, geographic distribution, etc. ), and the reasons for this disparity are poorly understood. Presumably, some genetic function(s) must be missing or reduced in Wolbachia-dependent worms in comparison to their Wolbachia-free counterparts, forcing them to rely on the bacteria as an alternative source of vital gene products. The processes underpinning Wolbachia-dependence are of biological and medical interest, as the Wolbachia products required by the dependent worm may represent useful targets for novel anti-filarial chemotherapies. Wolbachia endobacteria and the eukaryotic mitochondria share many common features, including the intracellular lifestyle, obligatory mutualism, reduced genome size, vertical transmission, etc. These shared features, as well as their shared ancestry in the order Rickettsiales [11–13], lead us to hypothesize that Wolbachia may contribute to energy metabolism in the filarial host. Previous studies have shown that antibiotic-mediated Wolbachia depletion leads to upregulation in genes related to energy metabolism, including mitochondrially encoded subunits of the respiratory chain . This impact on host mitochondrial gene expression, and presumably energy production, suggests that Wolbachia may serve as an alternative energy source or mitochondrial “supplement,” necessitating increased activity when the endosymbiont is removed. If so, differences in mitochondrial function may account for discrepancies in Wolbachia status in the filarial lineage. The mitochondrial genome (mtDNA) is particularly sensitive to evolutionary pressure exerted by the Wolbachia infection. Vertically-transmitted Wolbachia are able to expand rapidly through insect populations due to the mechanisms of reproductive parasitism . Wolbachia and mitochondria are co-transmitted. Thus, the mtDNA(s) of the first infected individual(s) presumably expand concurrently with the Wolbachia infection. Such Wolbachia-mitochondria “sweeps,” characterized by unusually low degrees of variation in the mtDNA of infected populations, have been noted in many insect species [16–20]. A similar lack of mtDNA diversity is seen in populations of Dirofilaria immitis (canine heartworm) in comparison to Wolbachia-free, non-filarial nematodes . A Wolbachia-induced genetic bottleneck may have led to the fixation of different mtDNA types among infected filarial species as compared to uninfected species. The mtDNA sequences of 4 species of filarial nematodes, Onchocerca volvulus, D. immitis, Brugia malayi, and Setaria digitata, have been published. This report details the sequencing and analysis of the mtDNA sequences of 5 more species: Acanthocheilonema viteae Chandlerella quiscali, Loa loa, Onchocerca flexuosa and Wuchereria bancrofti. Studies of the distribution of Wolbachia within filarial nematodes have shown that the infection is prevalent among 2 of the 8 filarial subfamiles, the Onchocercinae and the Dirofilariinae [1, 2]. Agreement between the phylogenies of Wolbachia and their filarial hosts suggests that Wolbachia entered the filarial lineage prior to the diversification of these 2 subfamilies [1, 26]. 7 of the 9 species included in this study are members of the the Onchocercinae and Dirofilariinae. Four of these, B. malayi D. immitis O. volvulus and W. bancrofti, are Wolbachia-dependent [1, 3, 4, 27]. The other 3, A. viteae L. loa and O. flexuosa, are Wolbachia-free [1, 8, 10, 28], presumably due to secondary loss of the endosymbiont [1, 29]. Conversely, C. quiscali and S. digitata are Wolbachia-free and belong to subfamilies (Splendidofilariinae and Setariinae, respectively) that have not been shown to contain Wolbachia-infected species, suggesting that these subfamilies split from the lineage prior to the introduction of Wolbachia endobacteria [2, 9]. In light of the presumed impact of Wolbachia on the host mitochondria, we hypothesized that the mtDNAs of Wolbachia-dependent filaria may differ in gene content, arrangement or sequence as compared to those found in Wolbachia-free species whose ancestor(s) may not have undergone a Wolbachia-induced genetic bottleneck or evolved in the presence of an endobacterial partner capable of affecting host energy metabolism. The purpose of the reported study was to compare mtDNA from Wolbachia-dependent and independent filarial species in search of sequence level differences indicative of altered mitochondrial function. Our analyses revealed no differences that could be attributed to Wolbachia status. Future studies will be required to discover subtler affects of Wolbachia on the sequence or function of filarial nematode mitochondria. The mtDNAs of 5 species of filarial nematodes were sequenced, annotated and deposited in Genbank (see Table 1 for accession numbers). Genome length, AT-richness and base composition of the 9 mtDNAs are compared in Table 1. The newly sequenced mtDNAs are similar in size and AT content to those of other filarial species. So far, filarial mtDNAs range in size from 13,474 bp in O. volvulus to 13,839 in S. digitata and range in AT content from 73.7% in O. volvulus to 77.7% in C. quiscali[22, 25]. Information was taken from previous studies for B. malayi, D. immitis, O. volvulus, and S. digitata. Information regarding the Wolbachia status of species from various subfamilies is reported in . All 9 filarial mtDNAs encode the same 12 proteins, 22 tRNAs and 2 rRNAs with very short intergenic sequences (Figure 1). These genes are encoded in the same direction, a characteristic shared by most nematode mtDNAs. Synteny is perfectly preserved in all examined species with the exception of C. quiscali (Figure 1). In 8 of the 9 species, 5 tRNA genes (tRNAAla, tRNALeu2, tRNAAsn, tRNAMet and tRNALys) reside between the AT-rich region and NDL4. In C. quiscali, the tRNAMet gene is positioned between Cox3 and the AT-rich region apart from the main tRNA cluster, and the order of the other 4 tRNA genes is rearranged relative to other species. For a comparisons between the mtDNA arrangement among filarial and other nematodes, see . 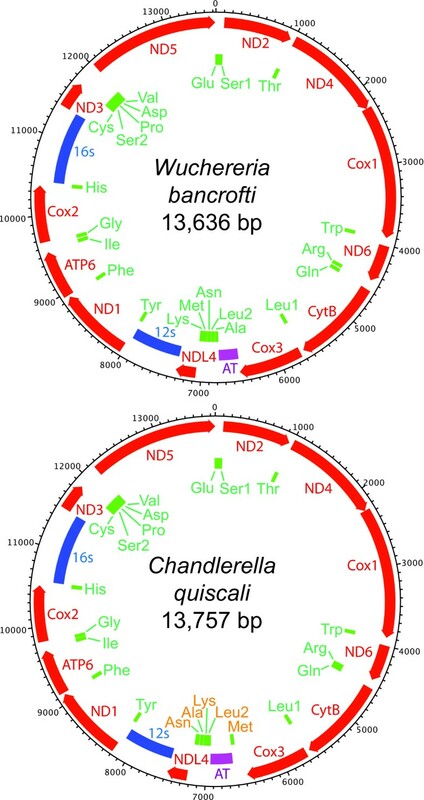 Comparative diagrams of the mitochondrial genomes of W. bancrofti and C. quiscali . Protein-coding genes are shown in red with arrowheads indicating directionality. rRNA and tRNA genes are shown in blue and green, respectively, and the AT-rich region is shown in purple. The diagram of the W. bancrofti mitochondrial genome is representative of most filarial mitochondria, as synteny is preserved in all species except C. quiscali. The 5 tRNA genes rearranged in C. quiscali are highlighted in orange. Twelve protein-coding genes were identified in each of the examined mtDNAs. None of these contain premature stop codons or frameshift mutations. Reverse transcription PCR reactions indicate that the predicted protein-coding genes were expressed at the RNA level in all examined species (Figure 2). Expression of mitochondrial protein-coding genes in six filarial nematode species. Expression of mitochondrial protein-coding genes was assessed by reverse transcription PCR in B. malayi, D. immitis, O. volvulus, A. viteae, C. quiscali and O. flexuosa. The following templates were used for each reaction: genomic DNA (G), cDNA (C), total RNA (R) and water (W). Filarial mtDNAs are extremely thymine (T)-rich (Table 1); therefore, it is not surprising that filarial mitochondria show a bias towards T-rich codons ( Additional file 1: Table S1). The most frequently used codon in all species is TTT, which encodes phenylalanine and serves as an alternative start codon in certain instances ( Additional file 1: Table S1, Table 2). The start and stop codons used by each species are listed in Table 2. Novel start codons include TGT for ND6 in W. bancrofti, TCT for CytB in A. viteae, and CCT for ND3 in O. flexuosa. Termination codons include TAG, TAA, and the incomplete stop codon T, which is converted to TAA upon addition 3’ poly(A) tail. All species encode 2 rRNA genes. In all species examined, the 12s rRNA gene is positioned between NDL4 and ND1 while the 16s rRNA gene is positioned between Cox2 and ND3 (Figure 1). The exact boundaries of these genes have yet to be mapped in any filarial species. All species also contain the same 22 tRNA genes. In the previously sequenced species, 20 of the 22 mitochondrial tRNAs share a common secondary structure in which the TΨC arm and variable loop are exchanged for a TV-replacement loop [22, 23] (Figure 3b). Conversely, the two tRNASer genes contain a DHU replacement loop in exchange for the typical D arm (Figure 3c) [22, 23]. The predicted mitochondrial tRNA structures of A. viteae followed this trend exactly, as did most of the tRNAs from the other examined species. However, our predictions indicate that tRNASer1 and tRNAAsn in C. quiscali, tRNALys and tRNAPro in L. loa, tRNATrp in O. flexuosa and tRNAPro in W. bancrofti may contain both the TΨC and D loops (Figure 3d-i). The same anticodons are used in all species with two exceptions. tRNAPro uses the anticodon AGG in O. volvulus D. immitis S. digitata and O. flexuosa, while the anticodon TGG is used in other species, and tRNALeu1 uses the anticodon TAA in A. viteae while the anticodon TAG is used in other species. Mitochondrial tRNA structures. The features of a typical tRNA include the acceptor stem, D arm, TΨC arm, variable loop and anticodon arm (A). 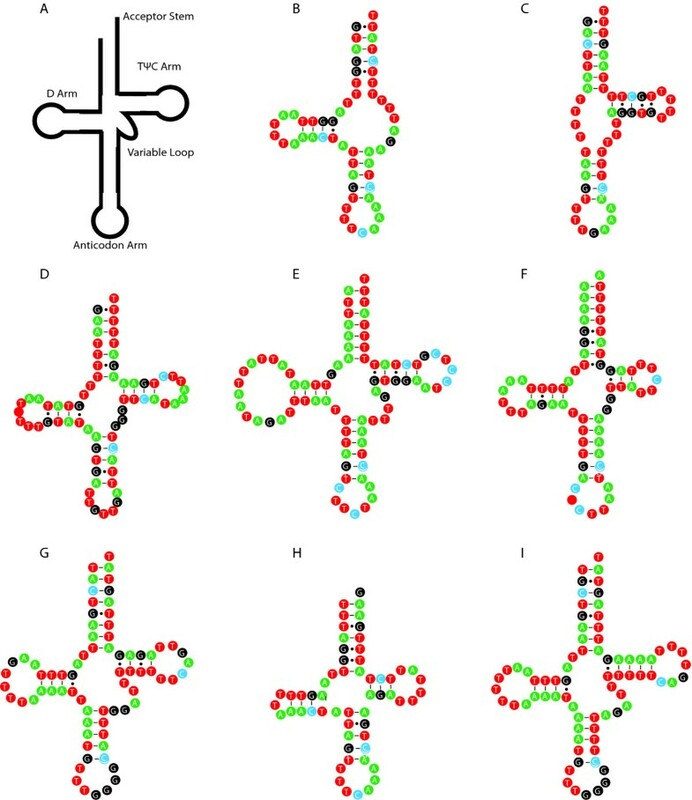 In most species, tRNASer1 and tRNASer2 contain a DHU replacement loop and TΨC arm, as in tRNASer2 from A. viteae (B), while all other tRNAs contain a D arm and TV replacement loop, as in tRNATrp of A. viteae (C). Exceptions may include tRNAAsn (D) and tRNASer1 (E) from C. quiscali, tRNALys (F) and tRNAPro (G) from L. loa, tRNATrp (H) from O. flexuosa, and tRNAPro (I) from W. bancrofti, as these structures are predicted to include both the D and TΨC arms. The control, or AT rich, region represents the largest non-coding region in filarial mtDNAs, which are otherwise densely packed with tightly spaced or slightly overlapping protein-coding, tRNA and rRNA genes. The AT rich regions of the 9 sequenced filarial mtDNAs range in size from 256 bp in W. bancrofti to 506 bp in S. digitata (Table 1). In most species, this region is located between Cox3 and tRNAAla. The unusual arrangement of tRNA genes in C. quiscali places its proposed 308 bp AT rich region between the tRNAMet and tRNALeu2 genes, leaving an additional 109 bp non-coding region between the Cox3 and tRNAMet genes. The function of this secondary non-coding region is unknown. A phylogenetic analysis was carried out using the nucleotide sequences of the 12 protein coding genes from the fully-sequenced filarial mtDNAs (Figure 4). Trees were left unrooted since the closest relatives of filarial nematodes with complete mtDNA sequences (i.e. Ascaris and Toxocara species) are still too divergent to allow for accurate alignment. Overall, topology is similar to that of trees based on single mitochondrial genes (i.e. 12s rRNA gene, Cox I) with improved statistical support [2, 26, 30]. As in the previous studies, our molecular phylogeny does not agree with the classical taxonomy of the filariae, as the Dirofilariinae and Onchocercinae appear as polyphyletic groups. In our tree, the lymphatic filariae cluster together, as do the genera Onchocerca and Dirofilaria. C. quiscali, which has not been included in previous analyses, is most closely related to the lymphatic filariae and L. loa. A. viteae and S. digitata are basal to the other species in our study. Simpler neighbor joining trees were constructed for each individual gene (data not shown). As in the tree based on concatenated protein coding sequences, clustering is never reflective of Wolbachia status. Phylogeny of filarial nematodes based on mtDNA sequences. Phylogenetic analysis was based on the concatenated nucleotide sequences of the twelve protein coding genes. Percentages of Bayesian posterior probabilities are displayed at nodes. Black circles indicate Wolbachia-dependence while white circles indicate Wolbachia-independence. Filarial nematodes are widespread parasites that infect all classes of vertebrates except fish . Many of these are of socioeconomic and medical importance. However, the mtDNAs had only been sequenced from 4 filarial species [22–25]. In our study we characterized the mtDNAs of 5 additional species and used the newly available sequences to compare the mtDNA of Wolbachia-dependent and independent filarial nematodes. Initially, we hypothesized that there might be obvious differences in the mitochondrial genome sequences of Wolbachia-dependent and independent species due to the evolutionary pressure exerted by a co-transmitted endosymbiont that may impact the energy balance of its host [14, 16–21]. However, our data indicate that the mtDNAs of filarial nematodes are, thus far, remarkably similar. No major differences in genome length, AT content or codon usage were detected. All 9 species contain the standard 12 protein-coding genes, 22 tRNAs and 2 rRNAs. Differences in tRNA structure or anticodon usage are also minor and do not correlate to Wolbachia status. In light of these findings, it seems that Wolbachia has had little effect on the content of filarial mtDNA. In most filarial species, synteny was perfectly preserved. The rearrangement of 5 tRNA’s in C. quiscali probably reflects its evolutionary distance from the other species included in this study rather than its Wolbachia-free status (see Figure 4), as such rearrangements were not detected in other Wolbachia-free species. It will be necessary to sequence the mtDNAs of other members of the Splendidofilariinae in order to determine whether this rearrangement is species-specific or typical of the entire subfamily. However, this minor alteration in gene order is unlikely to impact overall mitochondrial function. If Wolbachia infection had led to the fixation of certain mitochondrial types in an ancestral population, one might expect to see higher degrees of sequence identity between species that have come into contact with the endosymbiont (i.e. species from the Onchocercinae and Dirofilariinae) as compared to species that have not . However, our phylogenetic analysis indicated that the level of sequence identity shared between mitochondrial protein-coding genes is independent of Wolbachia status. If it is true that filarial species considered primitive based on classical taxonomy (i.e. C. quiscali and S. digitata) were never associated with Wolbachia, the similarity of their mtDNAs to the others in this study makes it seem unlikely that Wolbachia have had a significant impact on mtDNA sequence. The lack of diversity in mtDNA sequences could be taken as an indication that the initial infection and theoretical Wolbachia-induced genetic bottleneck occurred in an ancestor of all filarial nematodes, but this is unlikely given the phylogenetic age of the filariae. Of course, one must consider that this study was performed on the level of complete genes. In the future, it may be informative to compare smaller loci in Wolbachia-dependent and independent species, as even single base changes are known to have profound effects on mitochondrial function . The fact that no sequence-level differences were observed between mitochondria from Wolbachia-dependent and independent filarial species does not exclude the possibility that differences may exist in mitochondrial function or efficiency between these groups. Of course, many of the genes related to oxidative phosphorylation and energy metabolism are encoded in the nuclear genome rather than the mitochondrial genome. Because only one filarial genome has been published (see  for the genome of B. malayi), we do not know if certain nuclear genes are missing or altered in Wolbachia-dependent species relative to their Wolbachia-independent counterparts. Even if there are no differences in the genes encoded by Wolbachia-dependent and independent filarial worms, it is possible that variation in expression levels could lead to differences in mitochondrial output. Expression levels may be partially dictated by the number of mitochondrial genomes present in each mitochondria or the density of mitochondria in a given organism. These factors are also variable. Quantitative real-time PCR techniques could be used to assess expression; however, careful normalization would be necessary to ensure accurate results when comparing expression levels across multiple species and life cycle stages. This type of analysis will not be possible until better nuclear genome data is produced to provide appropriate control sequences. Mitochondria and Wolbachia appear to share a common evolutionary story wherein bacteria of the Rickettsial family were taken up and transformed over time into an obligate mutualist that provides products essential to the life of the host. Since Wolbachia and mitochondria are co-transmitted and since Wolbachia may have an impact on host energy metabolism , it is possible that Wolbachia have affected the mitochondria of Wolbachia-dependent species in ways that are not reflected in the mtDNA sequence. Additional research will be required to test this hypothesis. Here we report the mitochondrial genome sequences of 5 species of filarial nematodes: Acanthocheilonema viteae, Chandlerella quiscali, Loa loa, Onchocerca flexuosa, and Wuchereria bancrofti. Although we had hypothesized that the presence of Wolbachia endobacteria in some filarial nematodes may have had an impact on the content, organization or sequence of filarial mtDNA, we found no evidence that supports this hypothesis. The 9 available filarial mitochondrial sequences are remarkably similar on the sequence level. Future studies may determine whether functional differences exist between the mitochondria of Wolbachia-dependent and independent filarial nematodes. Adult B. malayi and A. viteae were obtained from experimentally infected Mongolian jirds as previously described [33, 34]. Adult D. immitis were obtained from the Filariasis Research Reagent Resource Center (Athens, GA). Adult O. flexuosa were isolated from subcutaneous nodules dissected from red deer (Cervus elaphus) in Schleswig-Holstein, Germany . Adult O. volvulus, and microfilariae of W. bancrofti and L. loa were available from prior studies in Uganda, Papua New Guinea and Cameroon, respectively [8, 35, 36]. Adult Chandlerella quiscali were obtained from common grackles Quiscalus quiscula trapped in North Dakota, USA. DNA for sequencing was isolated from adult worms and microfilariae using the DNeasy Blood and Tissue Kit (Qiagen, Valencia, CA), ethanol precipitated to concentrate and stored in 1x TE buffer. RNA was isolated as previously described . Briefly, worms were homogenized by bead-beating in TRIzol (Invitrogen, Carlsbad, CA) and RNA was isolated by organic extraction with 1-bromo-3-chloropropane followed by column purification using the RNeasy Mini Kit (Qiagen) including an on-column DNase digest. A second DNase treatment was performed with the TURBO DNA-free Kit (Applied Biosystems, Austin, TX). cDNA was synthesized from total RNA using qScript cDNA SuperMix according to manufacturer’s suggested protocol (Quant Biosciences, Gaithersburg, MD) and purified with the Qiaquick PCR Purification Kit (Qiagen). Primers used to amplify mtDNA in 10 segments are reported in Additional file 2: Table S2. “Filarial Mito” primer sets are designed to target conserved portions of filarial mitochondria. In cases where the conserved primer set failed, species-specific primer sets were implemented. This was the case for segments 1–2, 7 and 9 in A. viteae, segments 5 and 8 in C. quiscali, segments 1, 4, 8 and 10 in L. loa, and segments 7 and 9 in W. bancrofti. All PCR reactions were performed using the Platinum Taq High Fidelity DNA polymerase (Invitrogen) according to the manufacturer’s suggested protocol with annealing temperatures adjusted to accommodate the thermodynamic properties of the primers. PCR products were cloned using the TOPO-TA Cloning Kit for Sequencing or the TOPO-XL PCR Cloning Kit (Invitrogen) depending on size, and sequenced by primer walking. Species-specific primers (given “RT” designation in the primer name) were designed to detect protein-coding sequences from cDNA. The sequences of these primers are reported in Additional file 2: Table S2. To detect expression, each PCR reaction included a DNA positive control, a cDNA test sample and total RNA and water-only negative controls. Contigs were assembled using Contig Express and analyzed using Vector NTI version 10.3.1 (Invitrogen). Sequences were verified by comparison with publically available sequence data from the Genbank sequence read archive for L. loa (accession number SRP000756) and W. bancrofti (accession number SRP000772). Protein-coding genes (including initiation and termination codons) and rRNAs were determined based on their homology to sequences reported from the mitochondrial genomes of B. malayi, D. immitis, O. volvulus and S. digitata[22–25]. In most instances, tRNA sequences were predicted using Arwen (available at http://130.235.46.10/ARWEN/)  and verified by homology to known filarial tRNA sequences. Any computationally predicted tRNAs that fell within other documented structures (i.e. protein-coding genes or rRNAs) were disregarded. tRNAAla and tRNALeu2 in A. viteae, tRNALeu2 and tRNAGly in O. flexuosa, and tRNAAla in L. loa were identified solely based on homology to known orthologs and the presence of the expected anticodon. Base composition and codon usage were calculated using the DNA Stats and codon usage features available from the Sequence Manipulation Suite (http://www.bioinformatics.org/sms2/dna_stats.html). Diagrams of complete mtDNAs were constructed using DNA plotter (http://www.sanger.ac.uk/resources/software/dnaplotter/) . The nucleotide sequences of the 12 protein coding genes, excluding stop codons, were aligned using Clustal W as implemented in MEGA4 using default parameters . Individual gene alignments were concatenated using FASconCAT . Model selection was performed using MrModeltest2.3 according to the Akaike information criterion . Bayesian Metropolis-coupled Markov chain Monte Carlo (MCMC) analysis was performed on the dataset with the GTR + I + G nucleotide substitution model by MrBayes Version 3.1.2 [42, 43]. Two simultaneous runs of 500,000 generations were performed with sampling every 100 generations and a 25% burn-in. The resulting phylogenetic tree was visualized in MEGA4 . We would like to thank Richard Lucius (Humboldt University, Berlin), the Filariasis Research Reagent Resource Center (Atlanta, Georgia), Samuel Wanji (University of Buea, Cameroon), Norbert Brattig (Bernard Nocht Institute for Tropical Medicine, Hamburg) and Yuefang Huang (Washington University School of Medicine, St. Louis) for providing parasite material. This research was funded by The Barnes Jewish Hospital Foundation. SNM was supported by NIH grant T32-AI007172 and JAV was supported by NIH grant R03-AI092306. SNM sequenced and assembled the mitochondrial genomes, carried out bioinformatic analyses and drafted the manuscript. ASM assisted in sequencing and assembling the mitochondrial genomes. JAV and VVT collected parasite material and assisted in revising the manuscript. GJW and PUF supervised study design and assisted in drafting and revising the manuscript. All authors have read and approved the final manuscript.